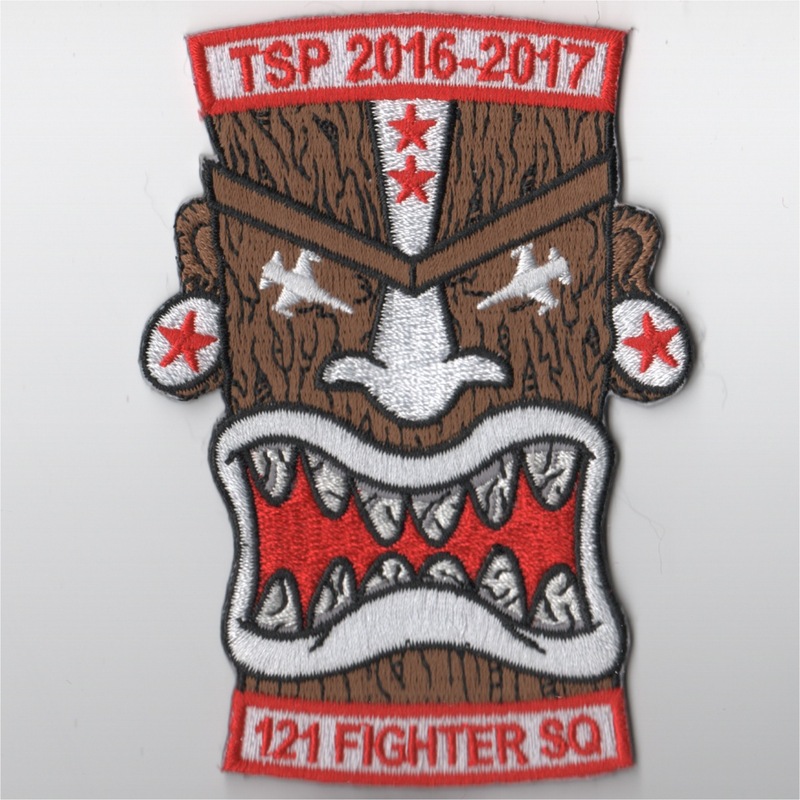 This is the "TSP 2017" shield patch for the 120th Fighter Squadron, the Colorado Air National Guard unit that flies the F-16C+ out of Buckley AFB in Denver, CO. This patch does not come with velcro attached. 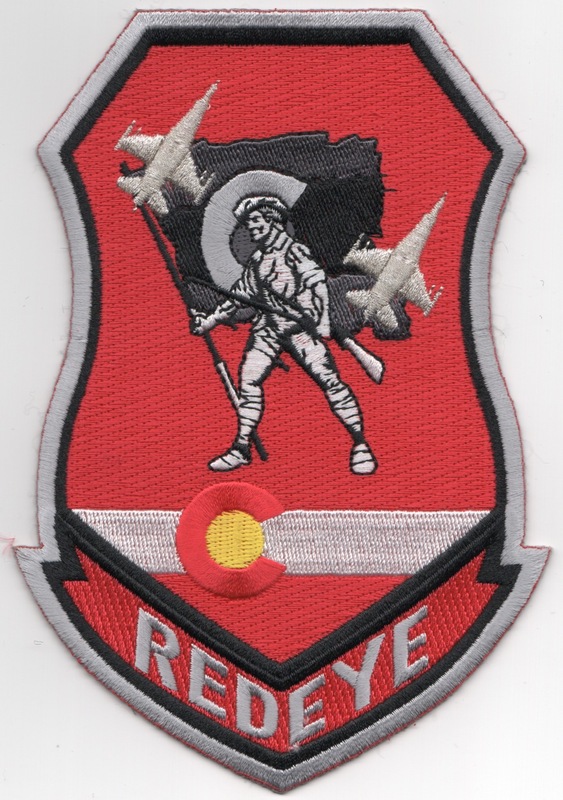 This is the "Redeye" shield patch for the 120th Fighter Squadron, the Colorado Air National Guard unit that flies the F-16C+ out of Buckley AFB in Denver, CO. 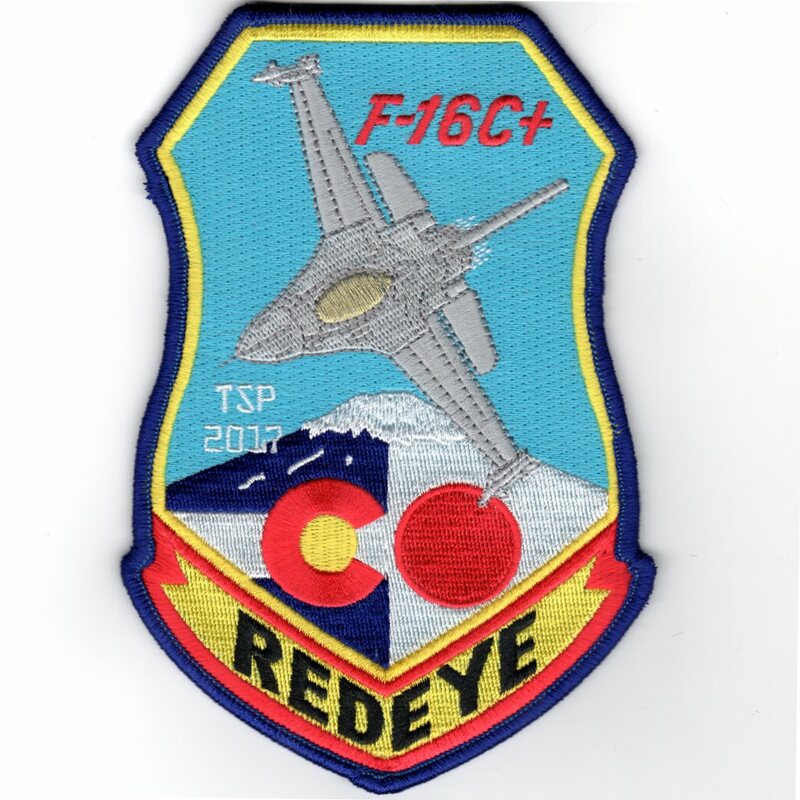 This is the desert version of the "Redeye" patch for the 120th Fighter Squadron, the Colorado Air National Guard unit that flies the F-16C+ out of Buckley AFB in Denver, CO. It is also used as their squadron designation as the 120th Expeditionary Fighter Squadron for when they are deployed. The 120th Fighter Squadron (120 FS) is a unit of the Colorado Air National Guard 140th Wing located at Buckley Air Force Base, Aurora, Colorado. The 120th is equipped with the F-16C/D Fighting Falcon. The squadron is a descendant organization of the World War I 120th Aero Squadron, established on 28 August 1917. It was reformed on 27 June 1923, as the 120th Observation Squadron, and is one of the 29 original National Guard Observation Squadrons of the United States Army National Guard formed before World War II. The 120FS was the first federally recognized Air National Guard unit, receiving this distinction on 30 June 1946. Thus, their motto is, "First in the Air Guard." This patch does not have velcro attached. 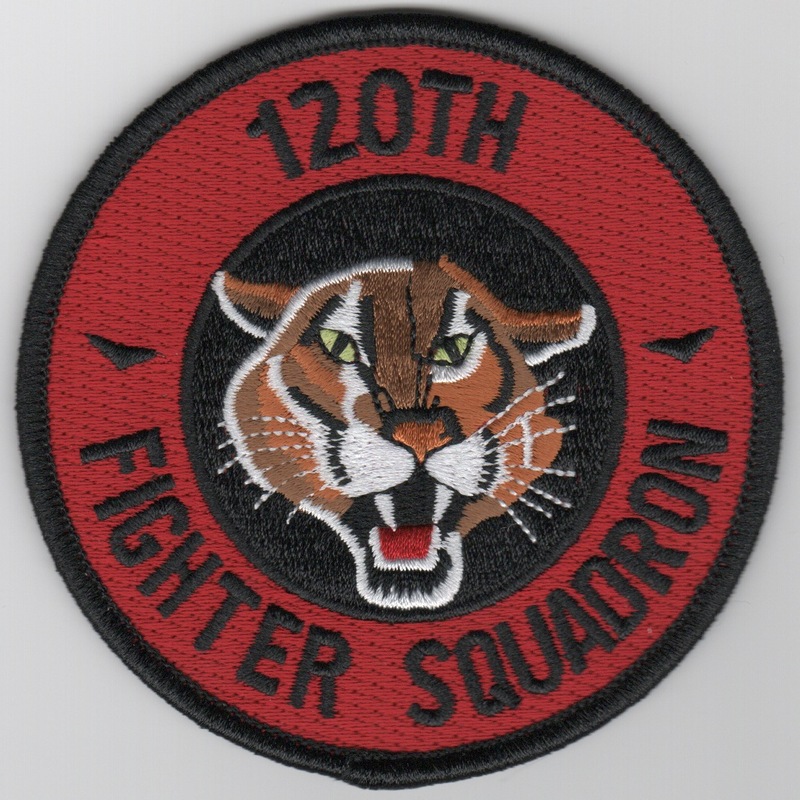 The 120th Fighter Squadron (120 FS) is a unit of the Colorado Air National Guard 140th Wing located at Buckley Air Force Base, Aurora, Colorado. The 120th is equipped with the F-16C/D Fighting Falcon. The squadron is a descendant organization of the World War I 120th Aero Squadron, established on 28 August 1917. It was reformed on 27 June 1923, as the 120th Observation Squadron, and is one of the 29 original National Guard Observation Squadrons of the United States Army National Guard formed before World War II. 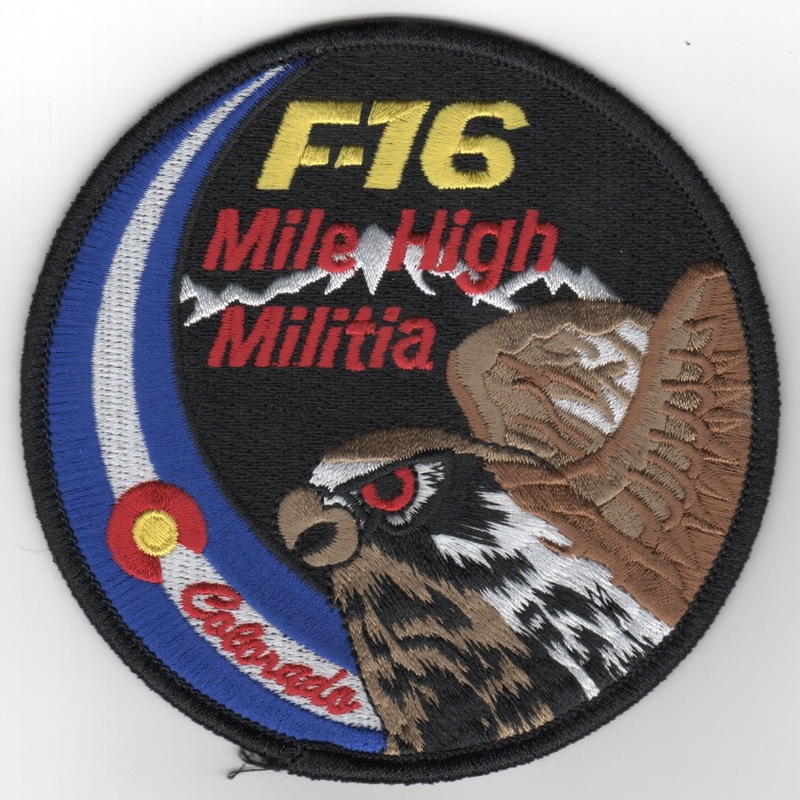 This patch says "MILE HIGH MILITIA" since they are located greater than 5,280 MSL......This patch does not have velcro attached. The 120th Fighter Squadron (120 FS) is a unit of the Colorado Air National Guard 140th Wing located at Buckley Air Force Base, Aurora, Colorado. The 120th is equipped with the F-16C/D Fighting Falcon. The squadron is a descendant organization of the World War I 120th Aero Squadron, established on 28 August 1917. It was reformed on 27 June 1923, as the 120th Observation Squadron, and is one of the 29 original National Guard Observation Squadrons of the United States Army National Guard formed before World War II. 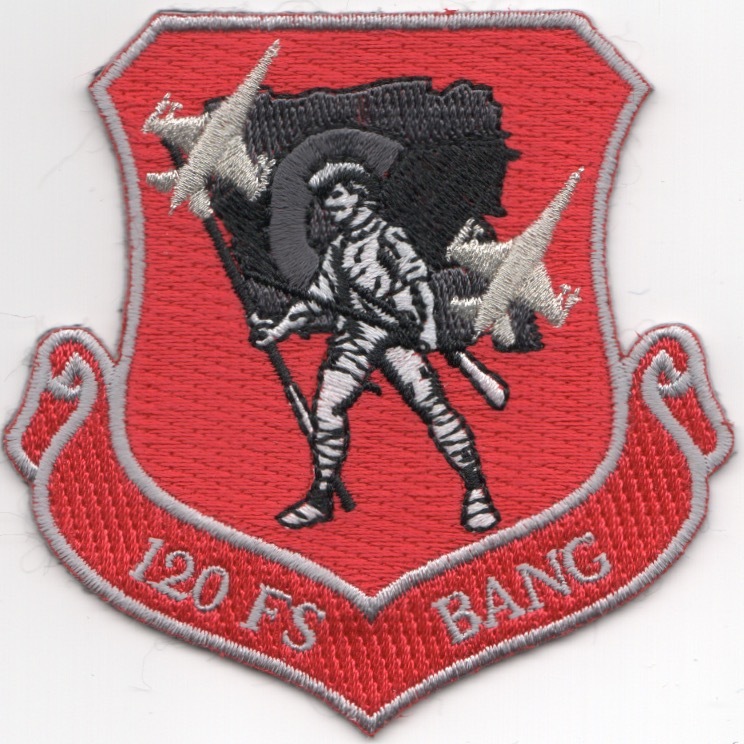 This is the red version of their "crest" patch and says "120FS BANG" (for Buckley AFB, CO) ......This patch does not have velcro attached. The 120th Fighter Squadron (120 FS) is a unit of the Colorado Air National Guard 140th Wing located at Buckley Air Force Base, Aurora, Colorado. The 120th is equipped with the F-16C/D Fighting Falcon. The squadron is a descendant organization of the World War I 120th Aero Squadron, established on 28 August 1917. 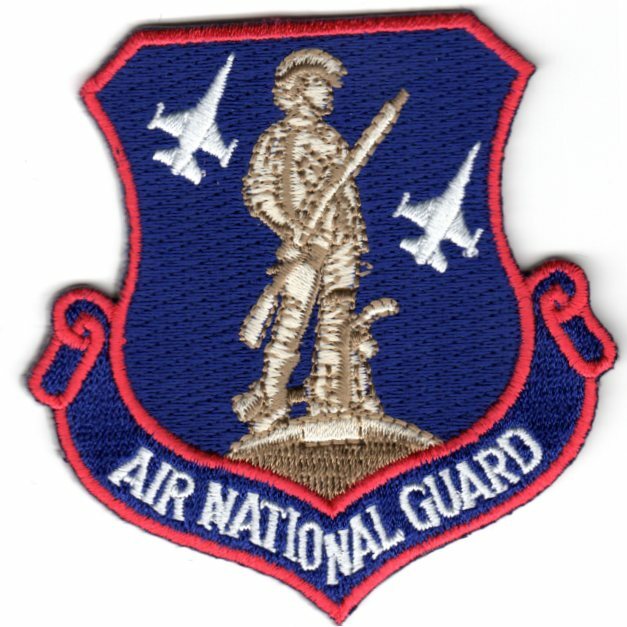 It was reformed on 27 June 1923, as the 120th Observation Squadron, and is one of the 29 original National Guard Observation Squadrons of the United States Army National Guard formed before World War II. 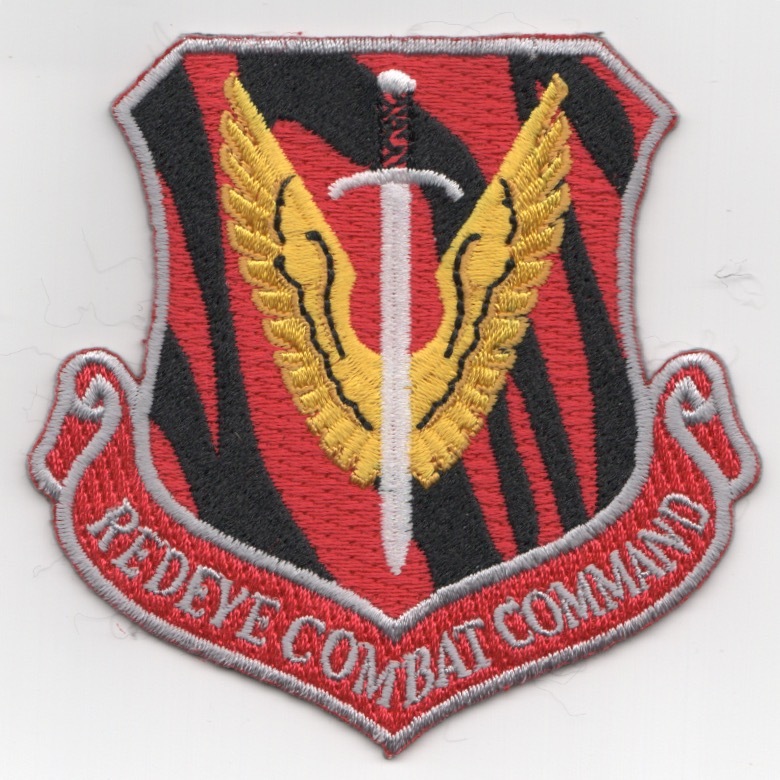 This is the red version of their "ACC" patch and says "REDEYE COMMBAT COMMAND" ......This patch does not have velcro attached. This is the large, red version of their "SHIELD" patch which says "REDEYE" along the bottom and has the minuteman with 2 F-16s (silver thread). This patch does not have velcro attached. 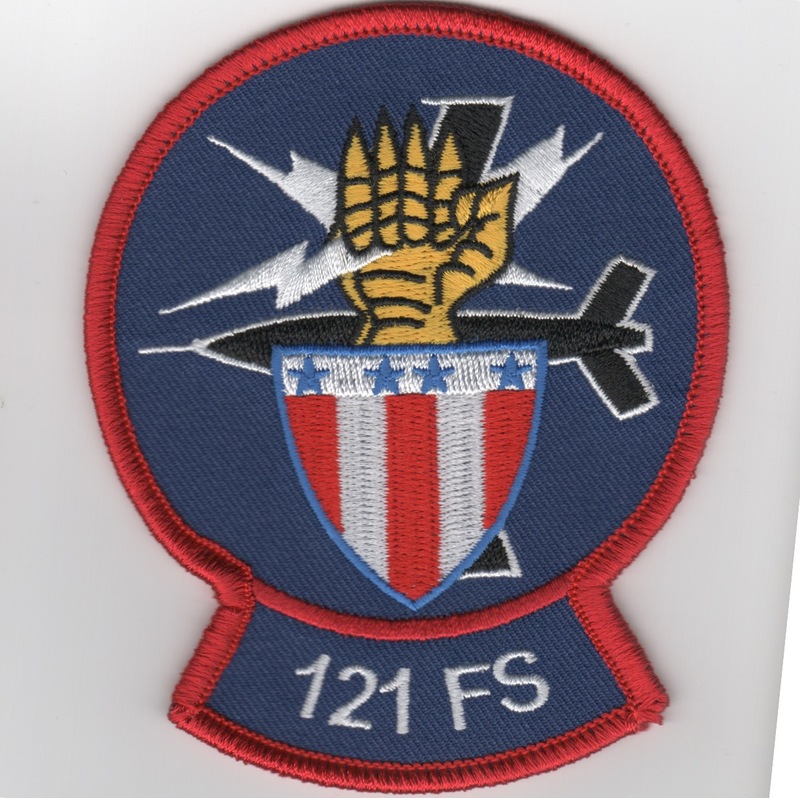 This is the 121FS squadron patch that shows a "Knights Glove" holding lightning bolts above a shield. 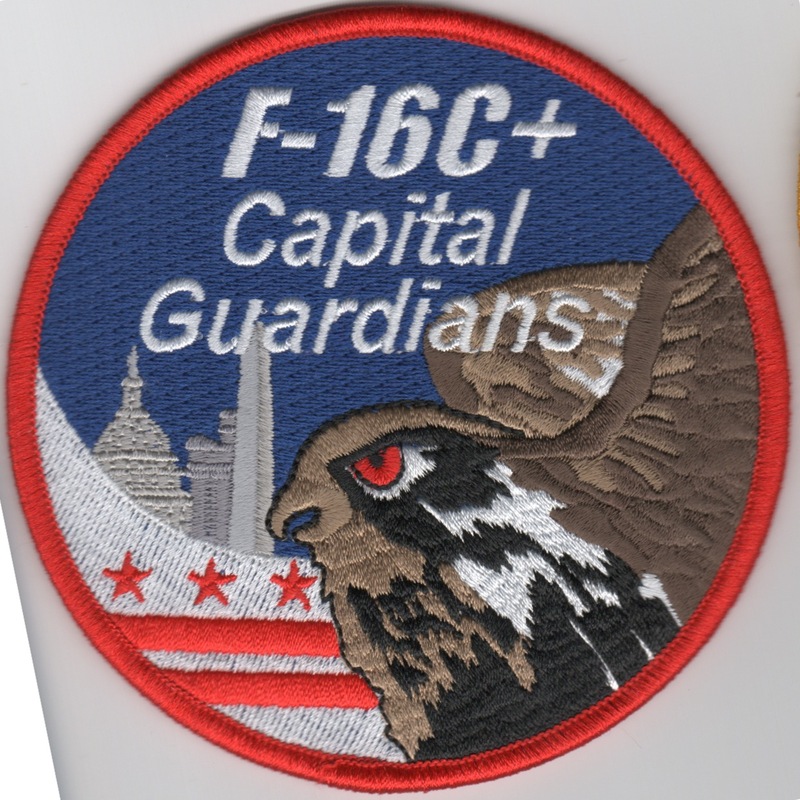 This is the 121FS 'Capital Guardians' patch that says "District of Columbia Air National Guard" and shows an F-16 over the White House. It has the white background and no velcro. 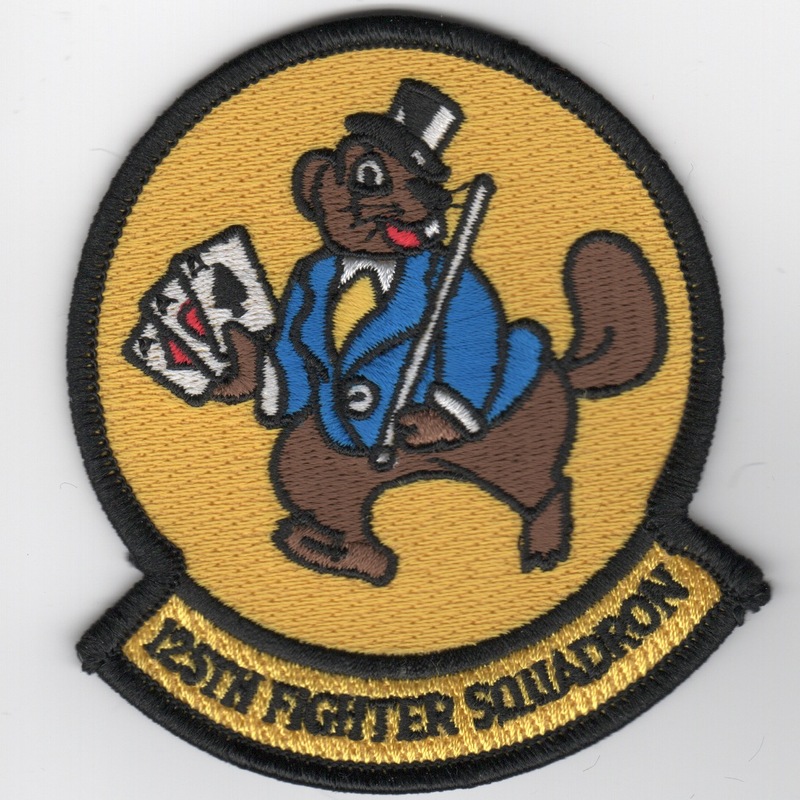 This is the dark blue version of the 121FS Air National Guard (ANG) crest patch depicting their current aircarft, the F-16 behind the "Minuteman"....this patch does not have velcro attached. 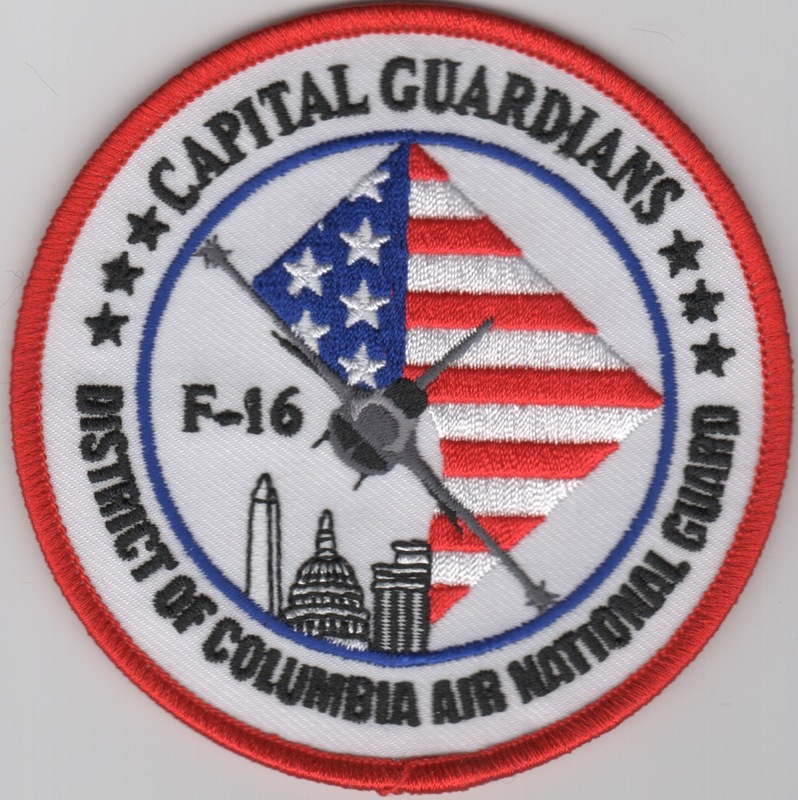 This is the 121FS 'Capital Guardians' patch that says "District of Columbia Air National Guard" and shows an F-16 over the White House. It is the "swirl" version and does not have velcro. The 121st Fighter Squadron (121 FS) is a unit of the District of Columbia Air National Guard 113th Wing located at Joint Base Andrews, Camp Springs, Maryland. The 121st is equipped with the Block 30 F-16C/D Fighting Falcon. 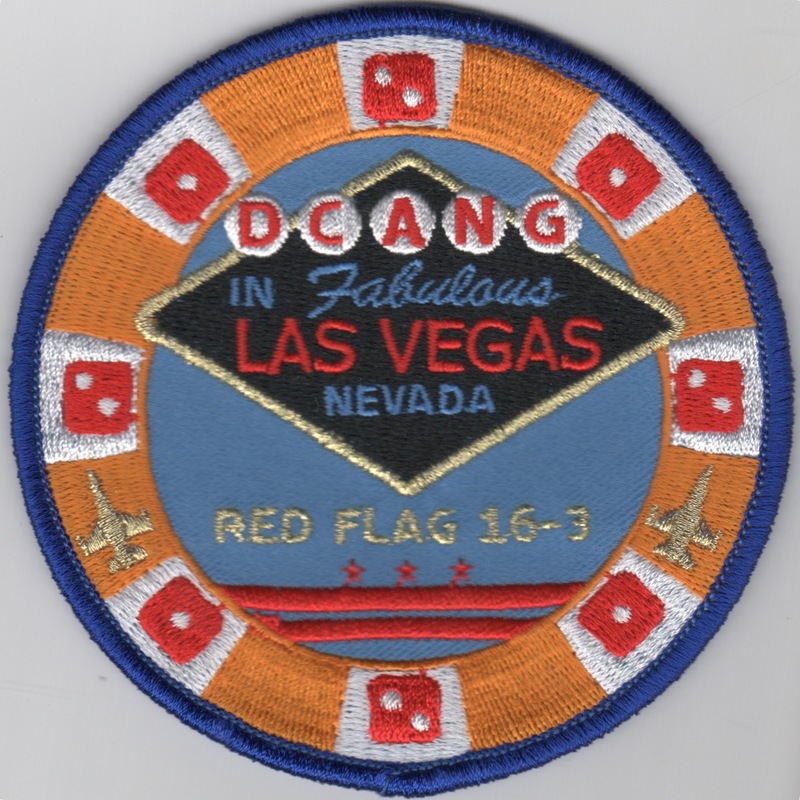 This is their "Red Flag 16-3" participation patch and does not have velcro. 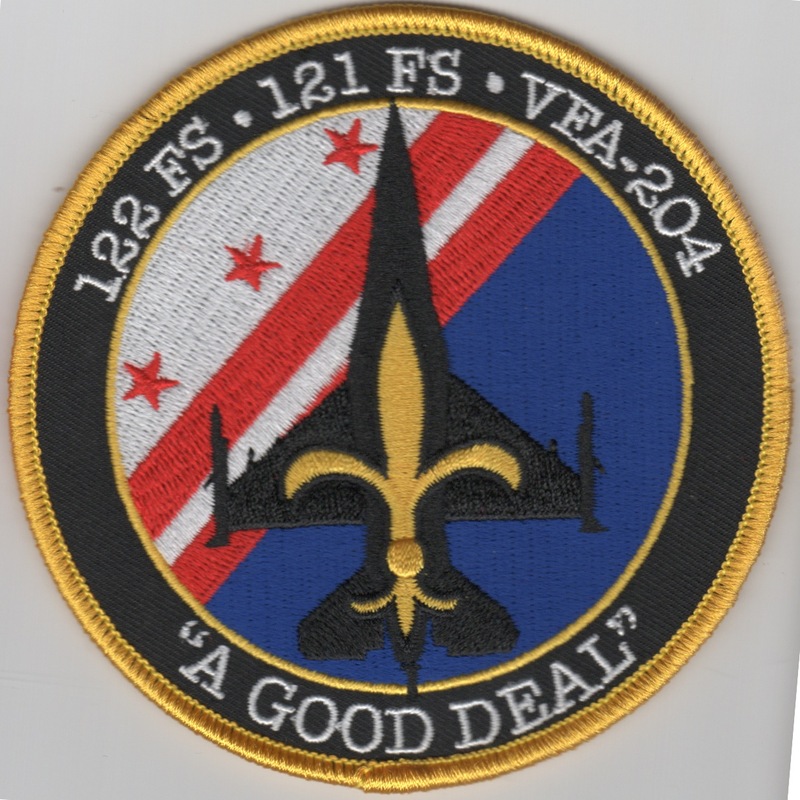 This is the detachment patch created for the 121FS, 122FS and the Navy's VFA-204 squadrons. It must have been an exercise in LA, as it shows the SAINTS (and Louisiana's) Flour-de-Lis. It says "A GOOD DEAL" along the bottom and does not have velcro. Twelve F-16s from the District of Columbia Air National Guard�s 121st Fighter Squadron deployed to Andersen AFB, Guam, in early November 2016, according to a Pacific Air Forces press release. 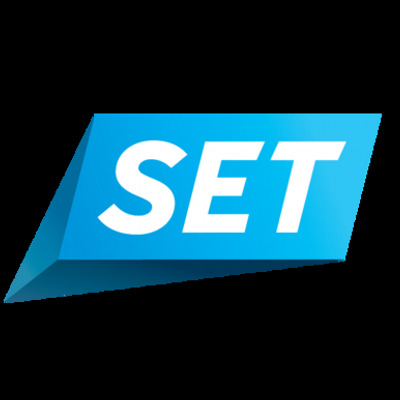 The deployment comes as participation in a Theater Security Package (TSP), which US Pacific Command has used since 2004 to support security and stability in the Indo-Asia-Pacific region. The 121st FS is stationed as JB Andrews, Md. This patch does not come with velcro attached. 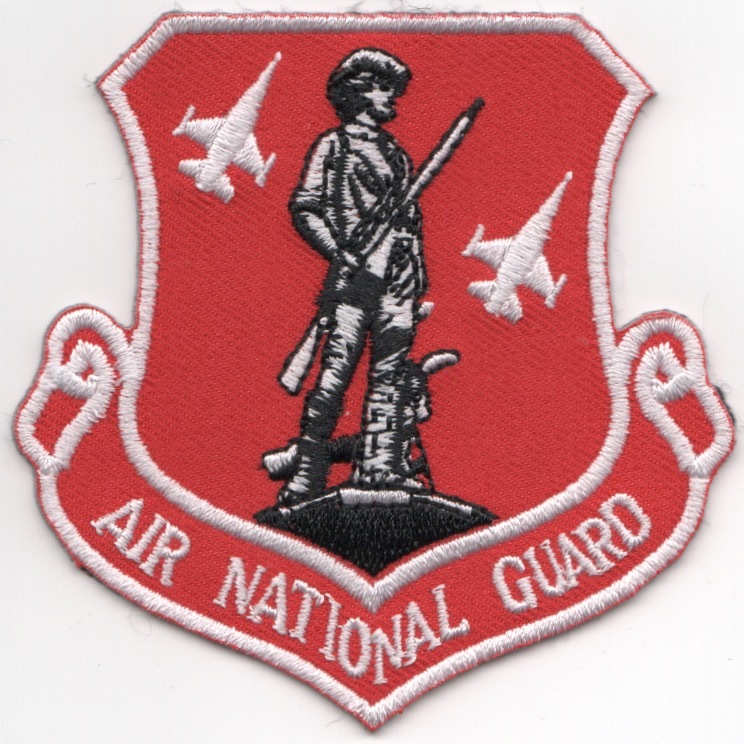 This is the red/black version of the "Air National Guard" Crest Patch showing the famous minuteman with the Viper in the background. This is the color version of the current squadron patch for the 124th Fighter Squadron that flies the F-16 for the IA Air National Guard out of Des Moines, IA. I just ran out of these, but am trying to get some more in. 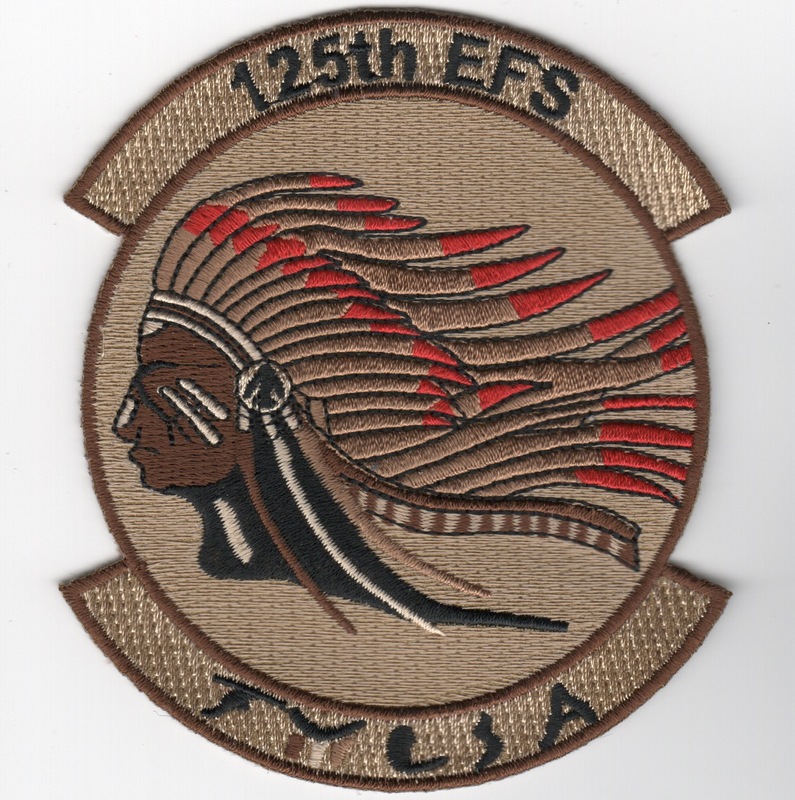 This is the desert version of the current squadron patch for the 124th Fighter Squadron that flies the F-16 for the IA Air National Guard out of Des Moines, IA. 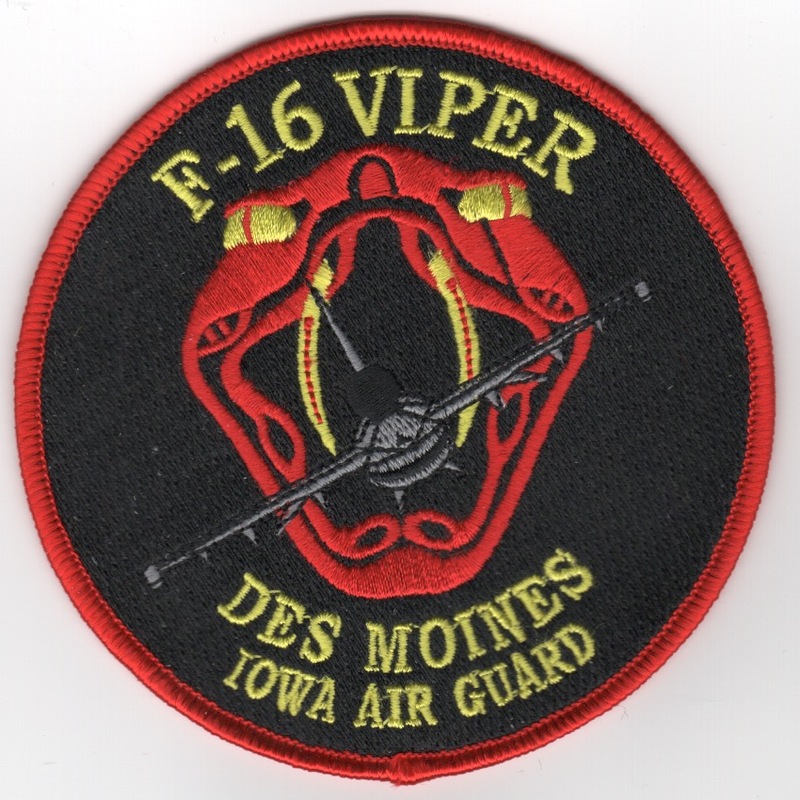 This is the red/black version of the current aircraft patch for the 124th Fighter Squadron that flies the F-16 for the IA Air National Guard out of Des Moines, IA. This patch does not come with velcro attached. This is the desert version of the current aircraft patch for the 124th Fighter Squadron that flies the F-16 for the IA Air National Guard out of Des Moines, IA. This patch does not come with velcro attached. This is the color version of the 2000 Hours aircraft patch for the 124th Fighter Squadron that flies the F-16 for the IA Air National Guard out of Des Moines, IA. This is the color version of the famous POW/MIA patch created for the 124th Fighter Squadron that flies the F-16 for the IA Air National Guard out of Des Moines, IA. This was inspired by the 128th Bomb Squadron's Nose Art patches. 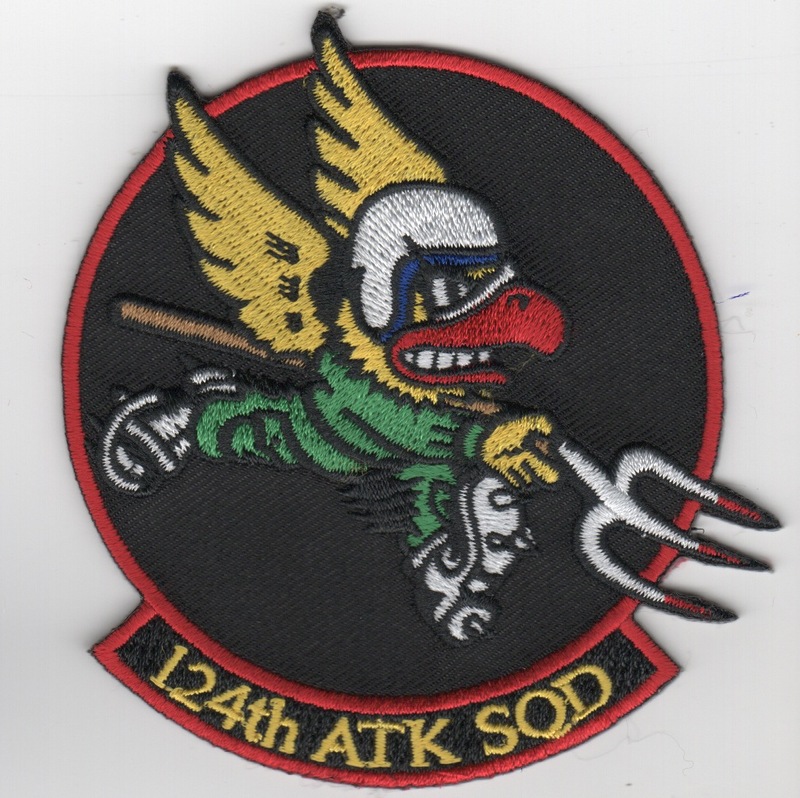 This is the red/black version of the squadron patch for the (now) 124th 'ATTACK' Squadron (I think) flying the MQ-9 REAPER(?) for the Air National Guard? Anyone have details on this transition? This patch does not have velcro on the back. 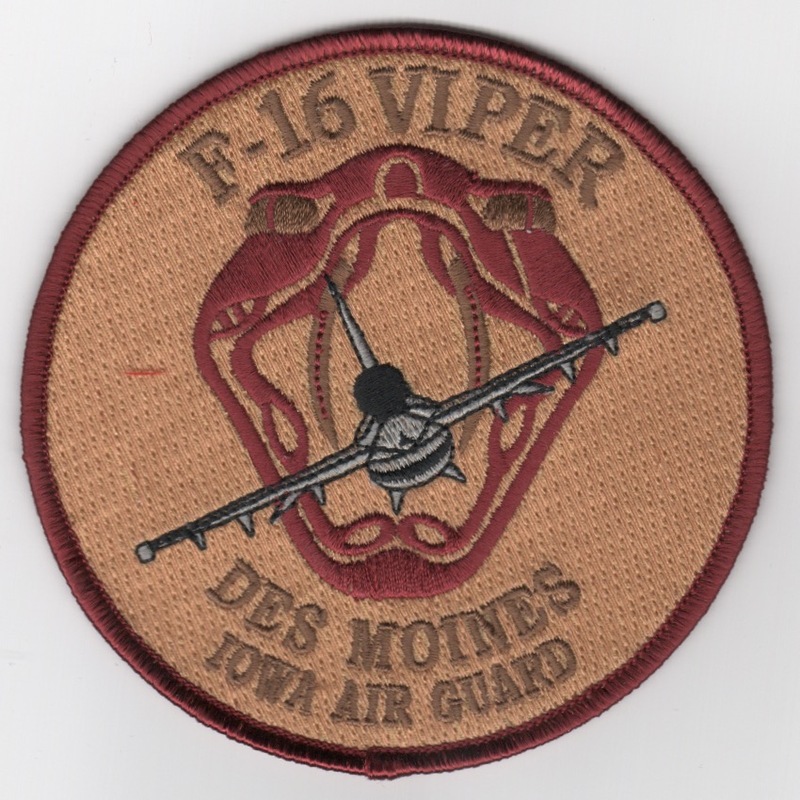 This is the color version of the "tab" patch worn on the left sleeve of the flight suit for pilots that fly the F-16 Viper for the IA Air National Guard out of Des Moines, IA. This is the desert version of the "tab" patch worn on the left sleeve of the flight suit for pilots that fly the F-16 Viper for the IA Air National Guard out of Des Moines, IA. 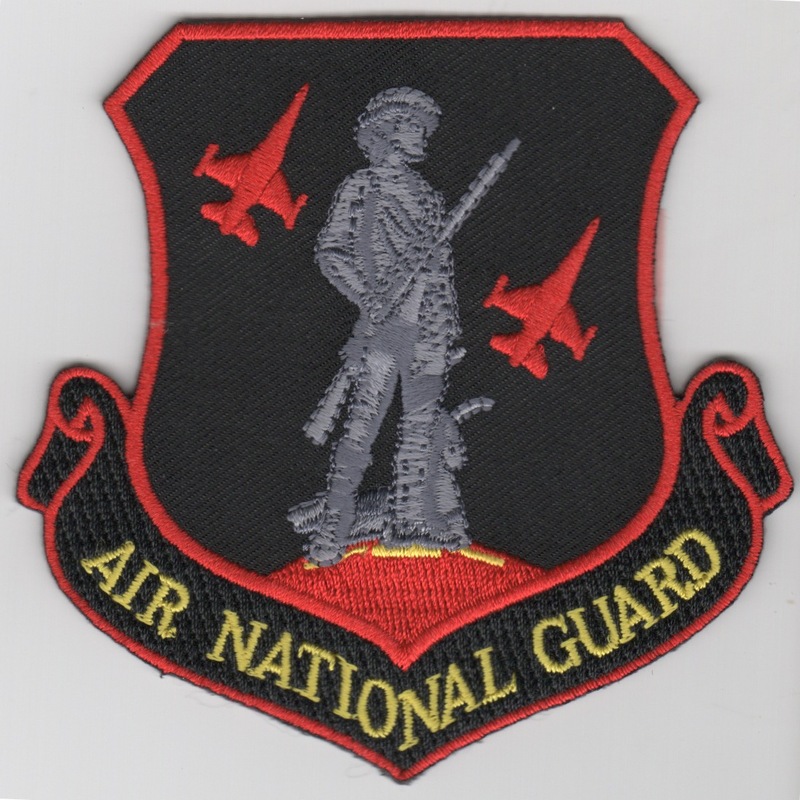 This is the red version of their Air National Guard 'Command Crest' patch. This patch does not come with velcro attached. The 125th Fighter Squadron (125 FS) is a unit of the Oklahoma Air National Guard 138th Fighter Wing located at Tulsa Air National Guard Base, Oklahoma. The 125th is equipped with the Block 42 F-16C Fighting Falcon. The squadron is a descendant organization of the 125th Aero Squadron, established on 30 July 1940. It was one of the 29 original National Guard Observation Squadrons of the United States Army National Guard formed before World War II. This is the yellow/color version of their squadron patch. The 125th Fighter Squadron (125 FS) is a unit of the Oklahoma Air National Guard 138th Fighter Wing located at Tulsa Air National Guard Base, Oklahoma. The 125th is equipped with the Block 42 F-16C Fighting Falcon. The squadron is a descendant organization of the 125th Aero Squadron, established on 30 July 1940. It was one of the 29 original National Guard Observation Squadrons of the United States Army National Guard formed before World War II. This is the desert version of their squadron patch. The 125th Fighter Squadron (125 FS) is a unit of the Oklahoma Air National Guard 138th Fighter Wing located at Tulsa Air National Guard Base, Oklahoma. They are equipped with the Block 42 F-16C Fighting Falcon. The squadron is a descendant organization of the 125th Aero Squadron, established on 30 July 1940. It was one of the 29 original National Guard Observation Squadrons of the United States Army National Guard formed before World War II. This is the desert version of their "expeditionary" squadron patch they wore when deployed and does not have velcro attached. The 125th Fighter Squadron (125 FS) is a unit of the Oklahoma Air National Guard 138th Fighter Wing located at Tulsa Air National Guard Base, Oklahoma. They are equipped with the Block 42 F-16C Fighting Falcon. The squadron is a descendant organization of the 125th Aero Squadron, established on 30 July 1940. It was one of the 29 original National Guard Observation Squadrons of the United States Army National Guard formed before World War II. 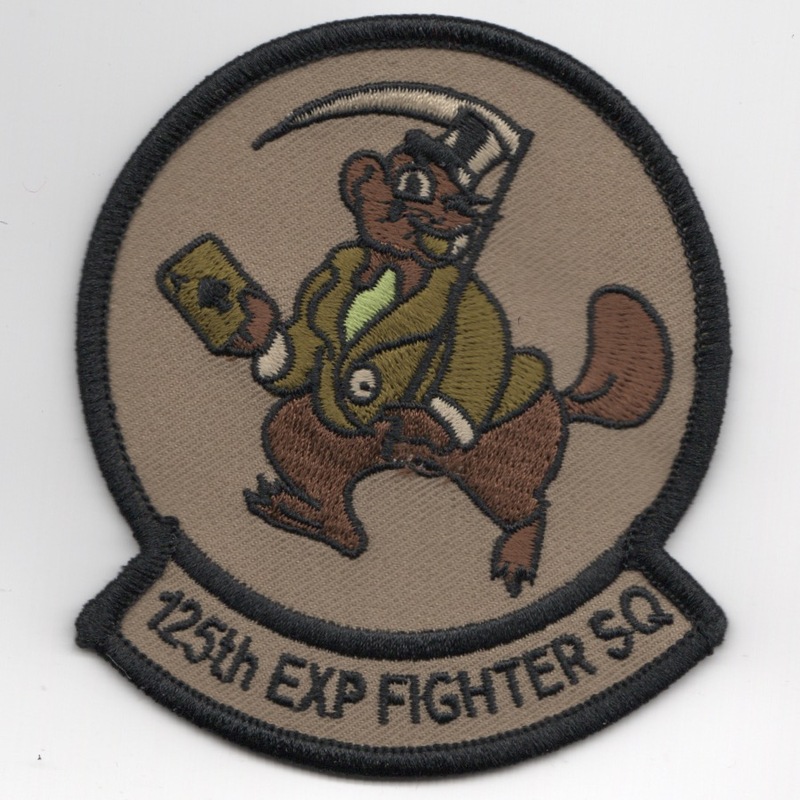 This is the OCP version of their "expeditionary" squadron patch they wore when deployed and does not have velcro attached. The 125th Fighter Squadron (125 FS) is a unit of the Oklahoma Air National Guard 138th Fighter Wing located at Tulsa Air National Guard Base, Oklahoma. They are equipped with the Block 42 F-16C Fighting Falcon. The squadron is a descendant organization of the 125th Aero Squadron, established on 30 July 1940. It was one of the 29 original National Guard Observation Squadrons of the United States Army National Guard formed before World War II. This is the red version of their squadron patch they wear on special occasions No velcro is attached. The 125th Fighter Squadron (125 FS) is a unit of the Oklahoma Air National Guard 138th Fighter Wing located at Tulsa Air National Guard Base, Oklahoma. They are equipped with the Block 42 F-16C Fighting Falcon. The squadron is a descendant organization of the 125th Aero Squadron, established on 30 July 1940. It was one of the 29 original National Guard Observation Squadrons of the United States Army National Guard formed before World War II. 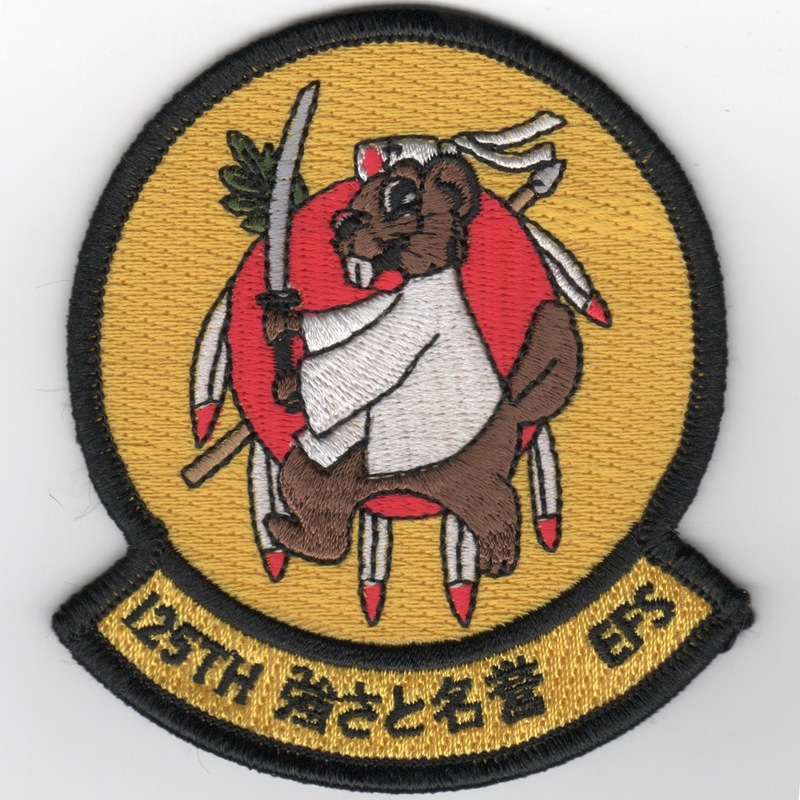 This is the yellow version of their "expeditionary" squadron patch they wore when deployed on a recent Okinawa Detachment. 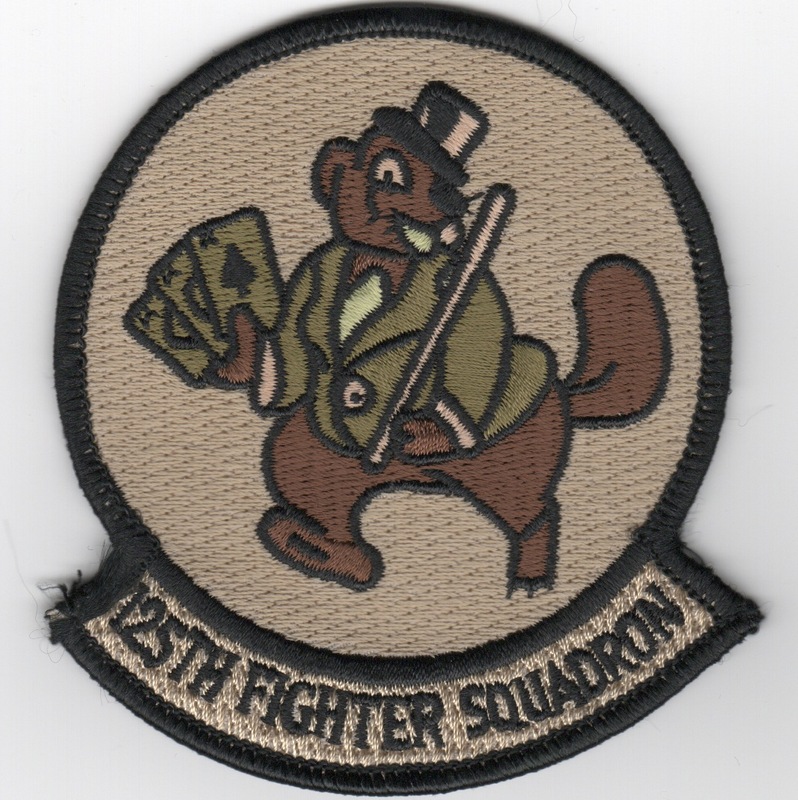 The 125th Fighter Squadron (125 FS) is a unit of the Oklahoma Air National Guard 138th Fighter Wing located at Tulsa Air National Guard Base, Oklahoma. They are equipped with the Block 42 F-16C Fighting Falcon. The squadron is a descendant organization of the 125th Aero Squadron, established on 30 July 1940. It was one of the 29 original National Guard Observation Squadrons of the United States Army National Guard formed before World War II. 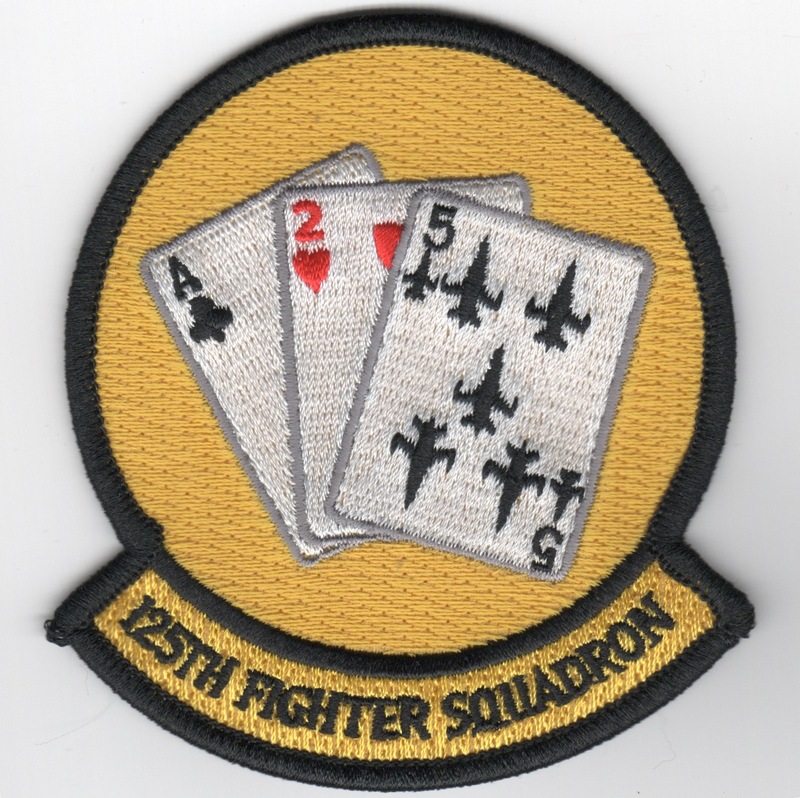 This is the yellow version of their "Ace-2-5 cards" squadron patch they wear on Fridays. This patch does not have velcro on the back. The 125th Fighter Squadron (125 FS) is a unit of the Oklahoma Air National Guard 138th Fighter Wing located at Tulsa Air National Guard Base, Oklahoma. They are equipped with the Block 42 F-16C Fighting Falcon. The squadron is a descendant organization of the 125th Aero Squadron, established on 30 July 1940. It was one of the 29 original National Guard Observation Squadrons of the United States Army National Guard formed before World War II. 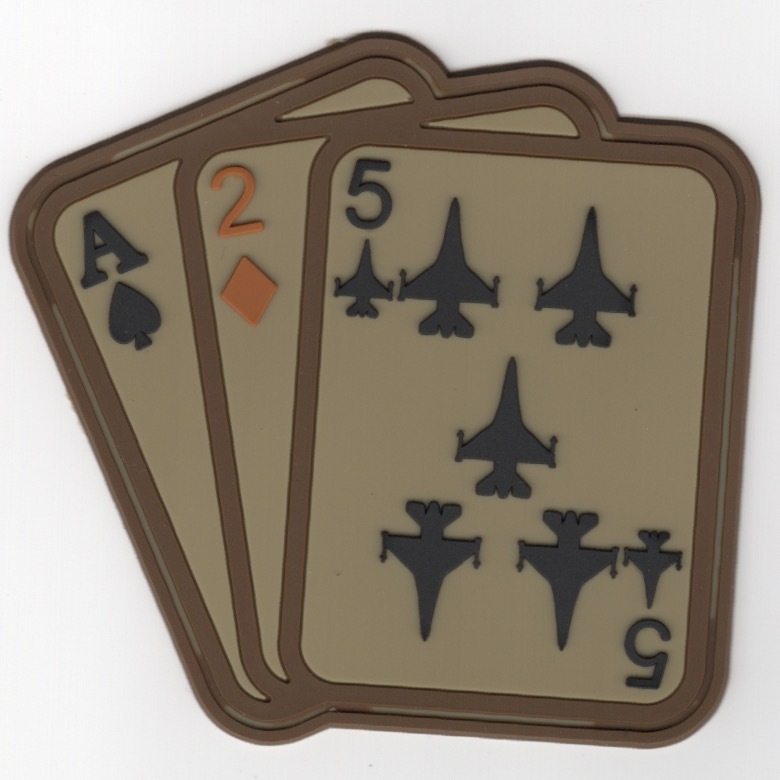 This is the desert-colored PVC (rubber/vinyl) version of their "Ace-2-5 cards" squadron patch they wear on Fridays. This patch does not have velcro on the back. 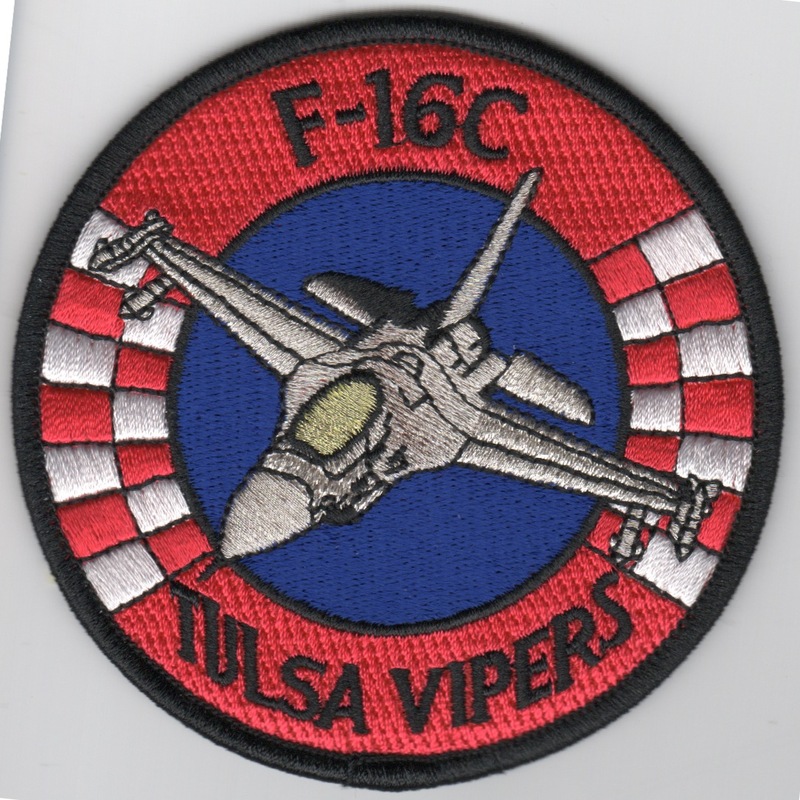 This is silver-threaded F-16 aircraft patch for the Tulsa, OK Air National Guard unit that flies the F-16CM variant under the guidance of the 138th Fighter Wing. This patch does not come with velcro attached. 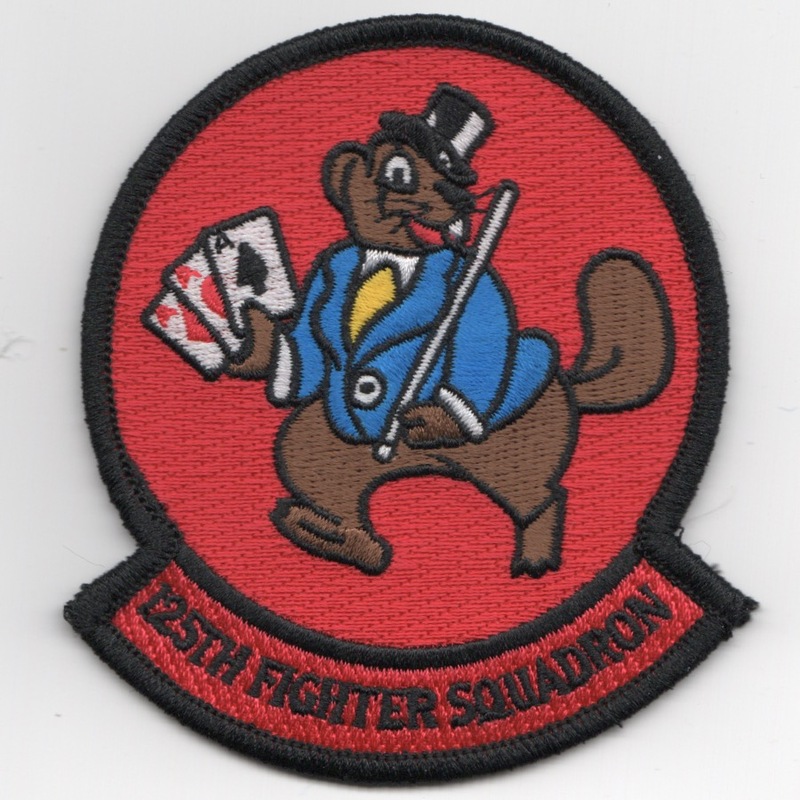 This is gray PVC (rubber/vinyl)version of the squadron's F-16 aircraft patch for the Tulsa, OK Air National Guard unit that flies the F-16CM variant under the guidance of the 138th Fighter Wing. 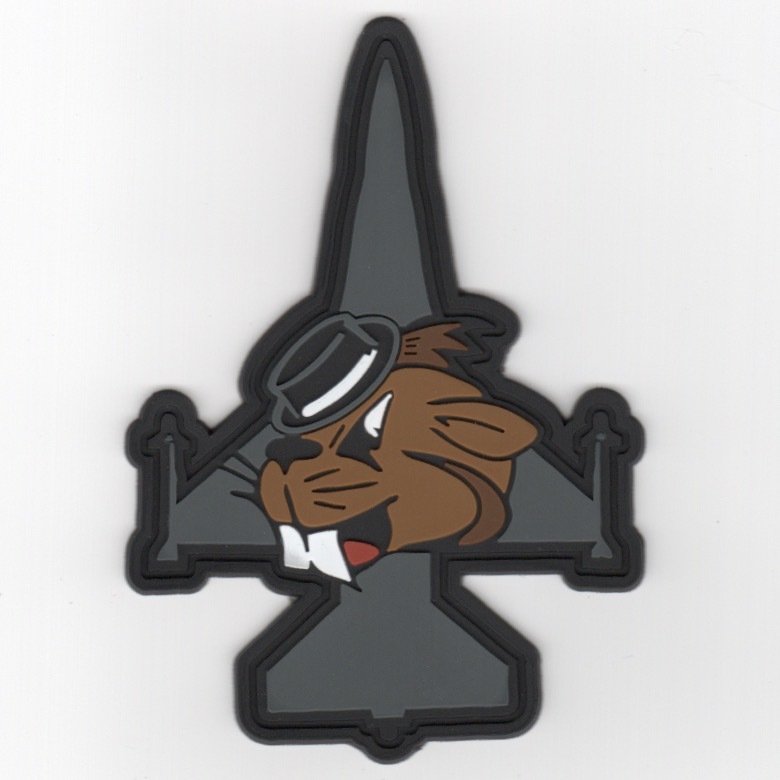 Shown on the planform of the Viper is a "brown beaver", which is their mascot. This patch does not come with velcro attached. 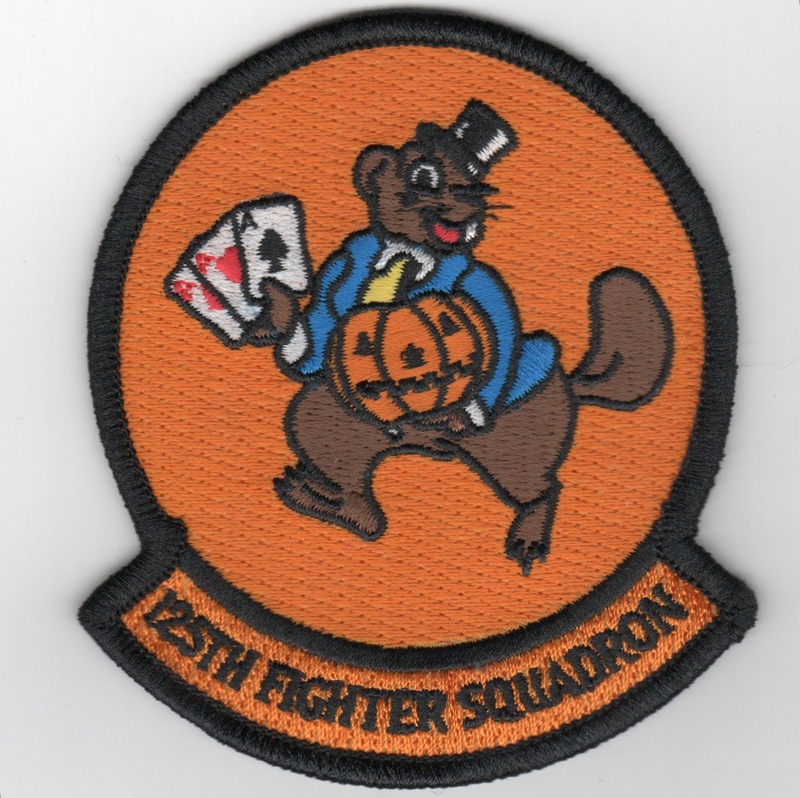 This is orange "HALLOWEEN" patch created for the 125th Fighter Squadron.....Notice the mascot is holding an orange pumpkin! This patch does not come with velcro attached. 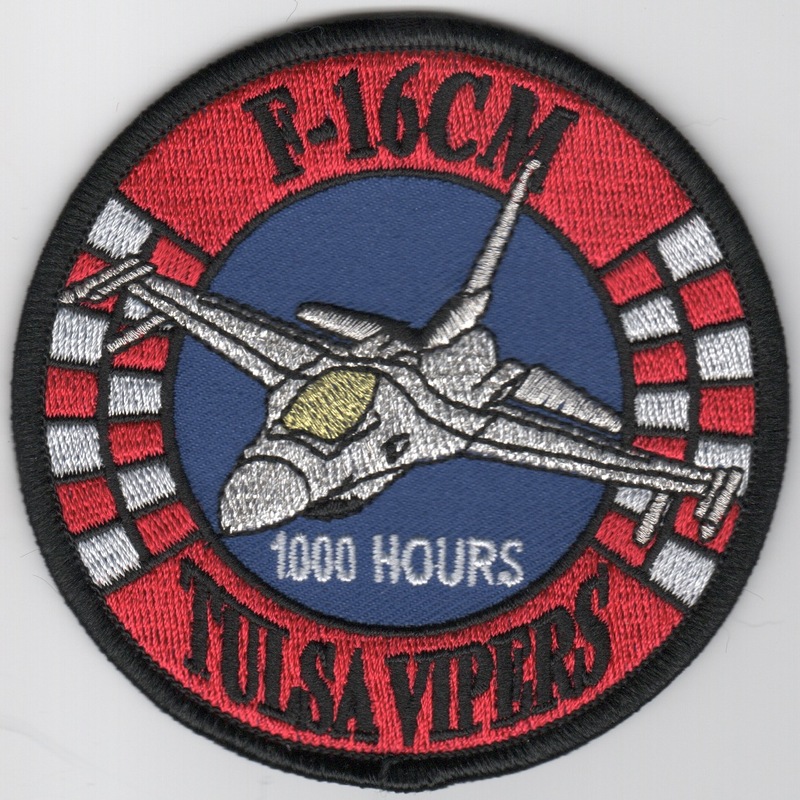 This is #1 of a 5 patch set of the Tulsa, OK Air National Guard unit that flies the F-16CM variant under the guidance of the 138th Fighter Wing. 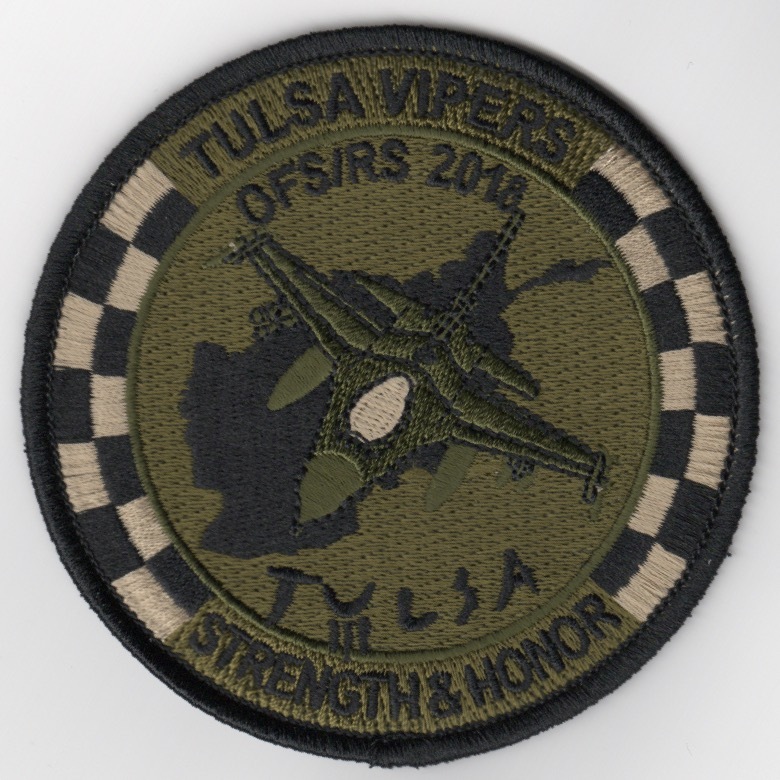 This is #2 of a 5 patch set of the Tulsa, OK Air National Guard unit that flies the F-16CM variant under the guidance of the 138th Fighter Wing. This one is given to those who have earned an "incentive" flight in the Viper. 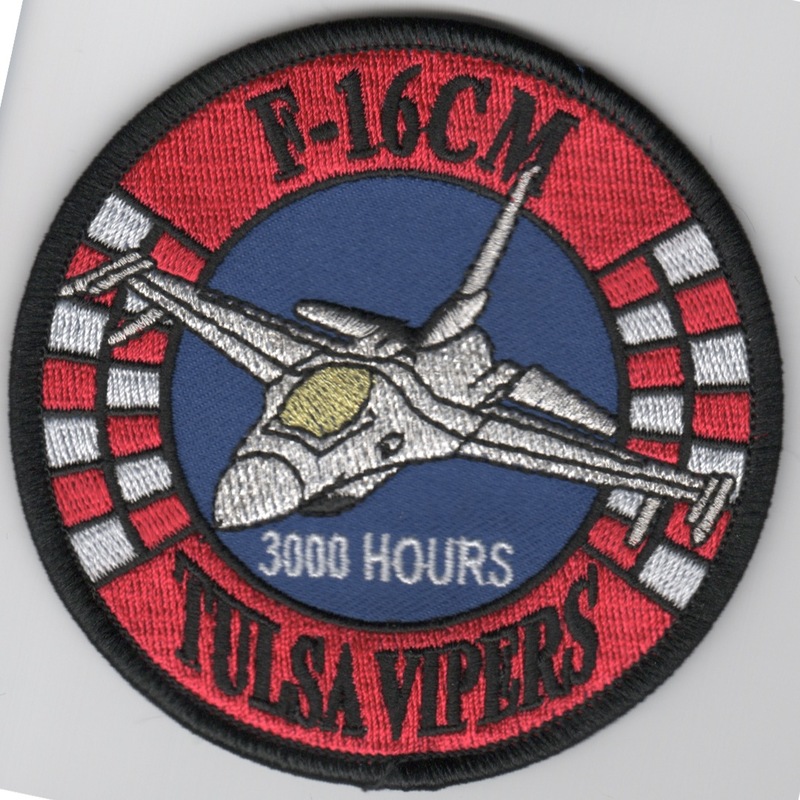 This is #3 of a 5 patch set of the Tulsa, OK Air National Guard unit that flies the F-16CM variant under the guidance of the 138th Fighter Wing. This one is worn by those who have 1000 hours in the Viper. 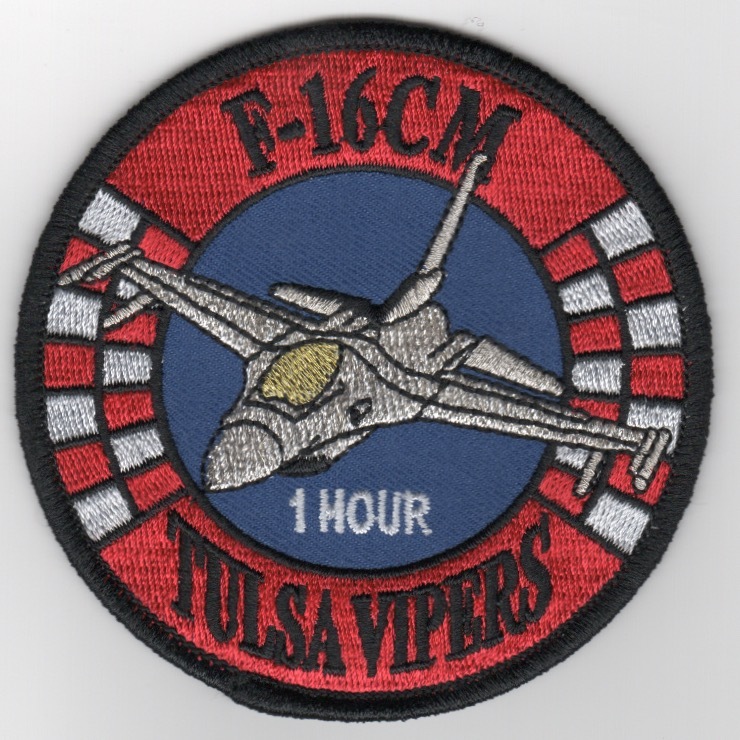 This is #4 of a 5 patch set of the Tulsa, OK Air National Guard unit that flies the F-16CM variant under the guidance of the 138th Fighter Wing. This one is worn by those who have 2000 hours in the Viper. 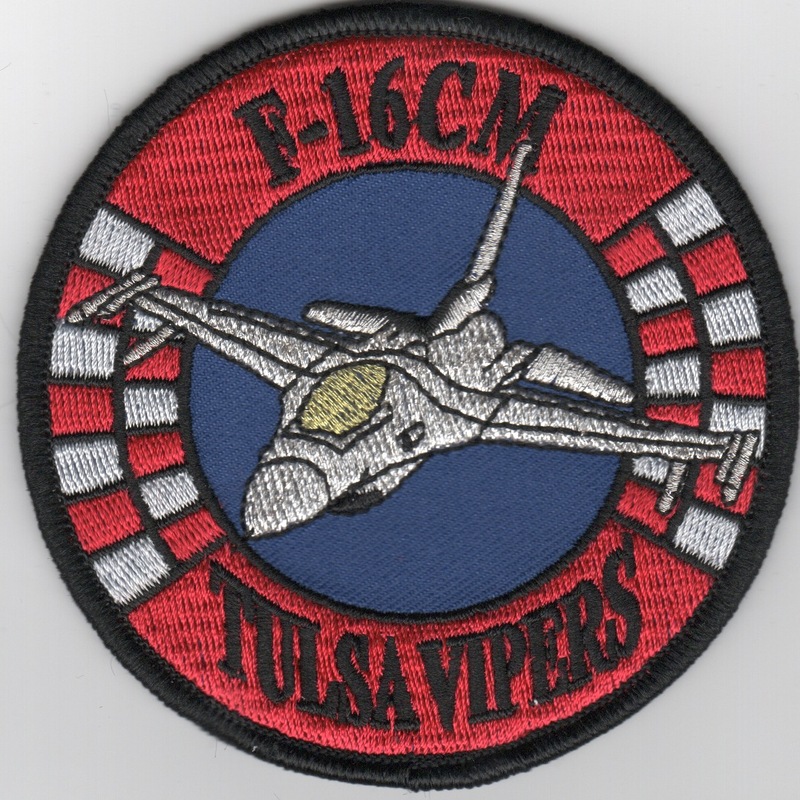 This is #5 of a 5 patch set of the Tulsa, OK Air National Guard unit that flies the F-16CM variant under the guidance of the 138th Fighter Wing. This one is worn by those who have 3000 hours in the Viper. 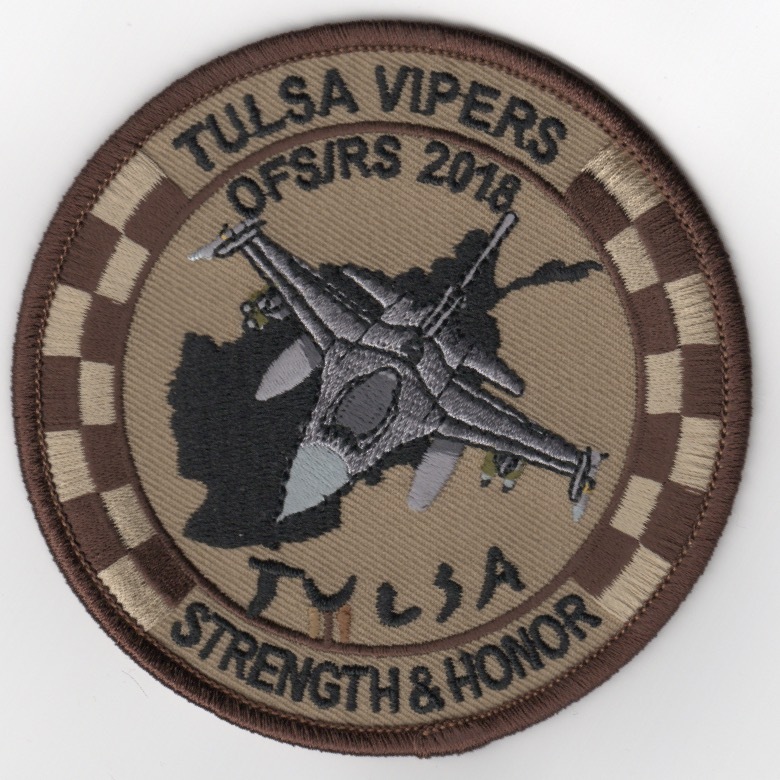 This is for the 5-patch set of the Tulsa, OK Air National Guard unit that flies the F-16CM variant under the guidance of the 138th Fighter Wing. This one is worn by those who have 1000-3000 hours in the Viper. 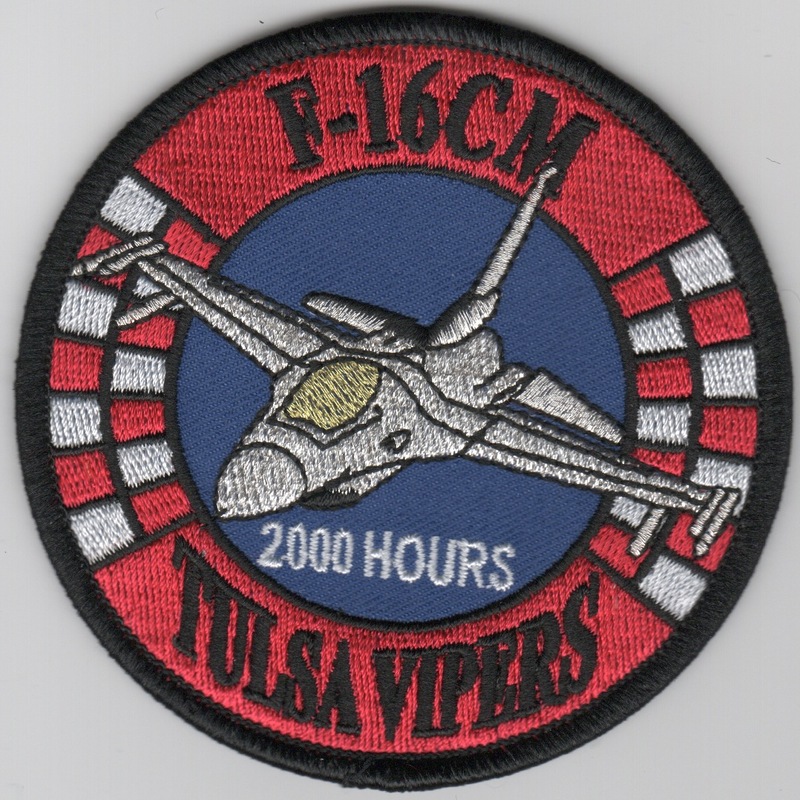 The 125th Fighter Squadron (125FS) is a unit of the Oklahoma Air National Guard, stationed at the Tulsa Air National Guard Base at Tulsa International Airport in Tulsa, Oklahoma. When activated to federal service as a United States Air Force unit, the 138 FW is gained by the Air Combat Command (ACC). This patch (shield) is their 25th Anniversary patch and does not have velcro. The 125th Fighter Squadron (125FS) is a unit of the Oklahoma Air National Guard, stationed at the Tulsa Air National Guard Base at Tulsa International Airport in Tulsa, Oklahoma. When activated to federal service as a United States Air Force unit, the 138 FW is gained by the Air Combat Command (ACC). This is their desert version of their patch is for their OFS/RS 2018 Det, states "STRENGTH AND HONOR" along the bottom, and does not have velcro. 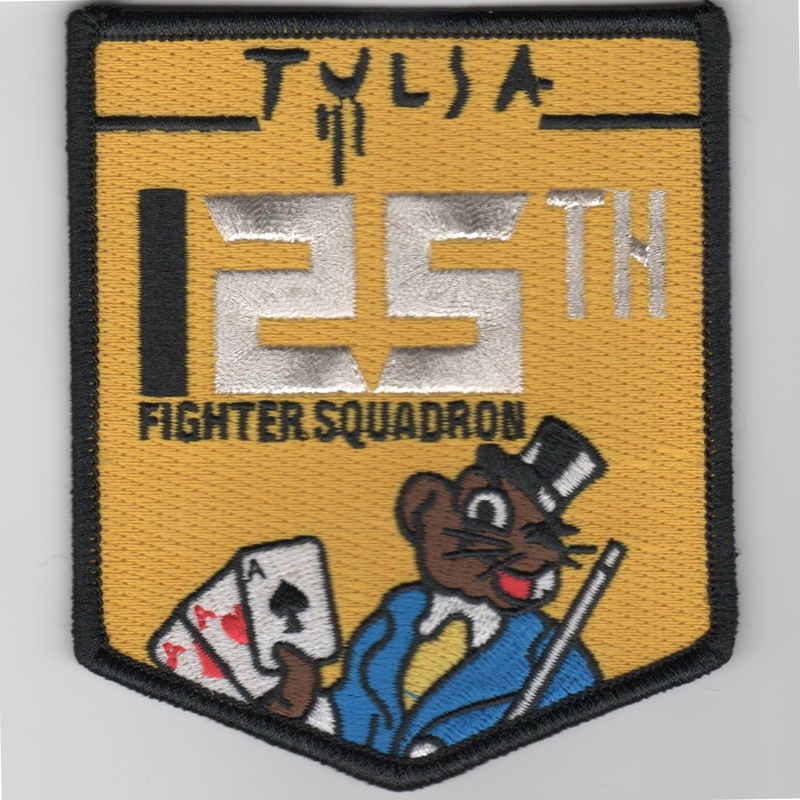 The 125th Fighter Squadron (125FS) is a unit of the Oklahoma Air National Guard, stationed at the Tulsa Air National Guard Base at Tulsa International Airport in Tulsa, Oklahoma. When activated to federal service as a United States Air Force unit, the 138 FW is gained by the Air Combat Command (ACC). This is their OD (subdued) Green version of their patch is for their OFS/RS 2018 Det, states "STRENGTH AND HONOR" along the bottom, and does not have velcro. Use this link to get one of each of the OFS/RS 2018 Det patches for the 125FS shown above.